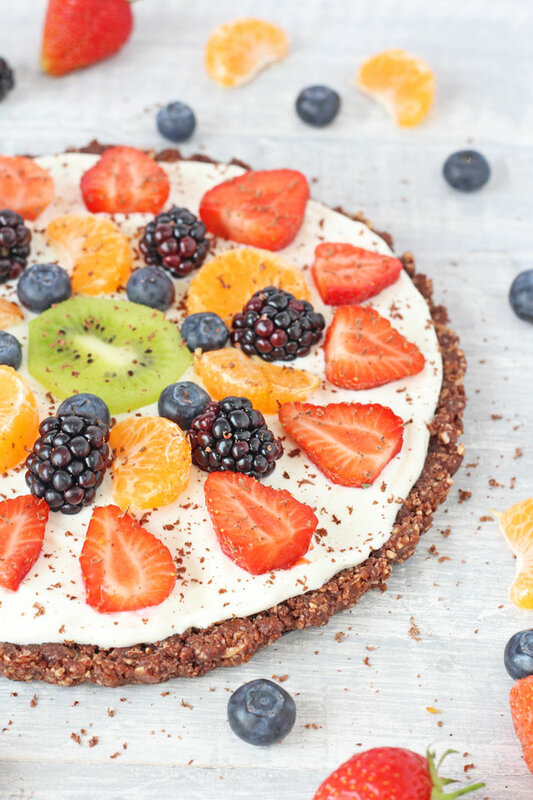 A super easy no bake Fruit Pizza recipe that’s gluten and grain free. 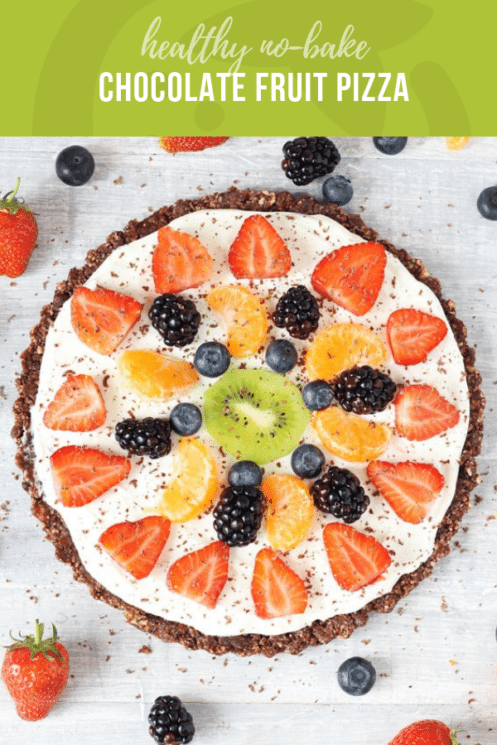 A fantastic healthy dessert that the whole family can enjoy this summer! 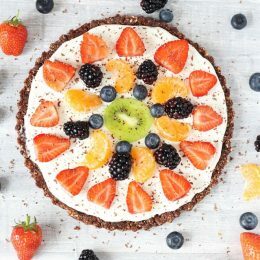 I don’t know about you but sometimes I really struggle to think of healthy dessert recipes and creative ways of getting my children to eat and enjoy more fruit. I love nothing more than a big bowl of fruit salad after a meal but my family don’t share my enthusiasm and would much rather tuck into a sugar-laden chocolate cake instead! So in an effort to keep everyone happy and eating healthily I came up with this recipe for Chocolate Fruit Pizza. 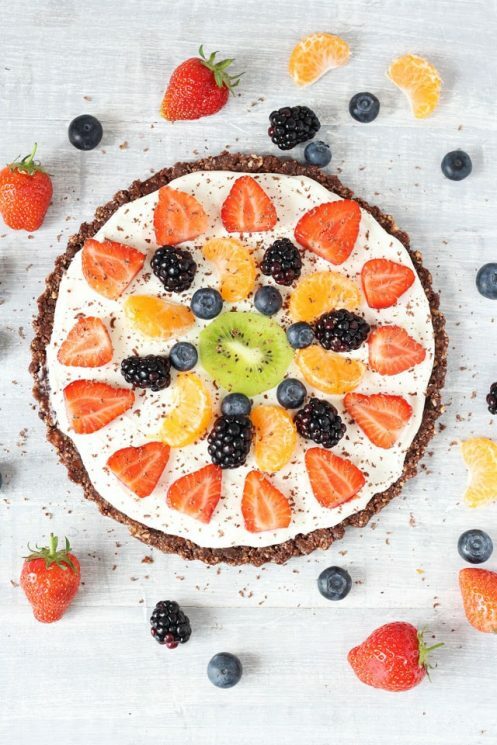 I used used unsweetened cocoa powder to give the base of the fruit pizza a delicious chocolatey taste. You could also use raw cacao powder but just be aware that the quantities will probably be a lot less. Everything is quickly blitzed together in a food processor. Then pressed into a springform tin or tart dish and placed in the fridge or freezer to set. The filling is even easier to make. 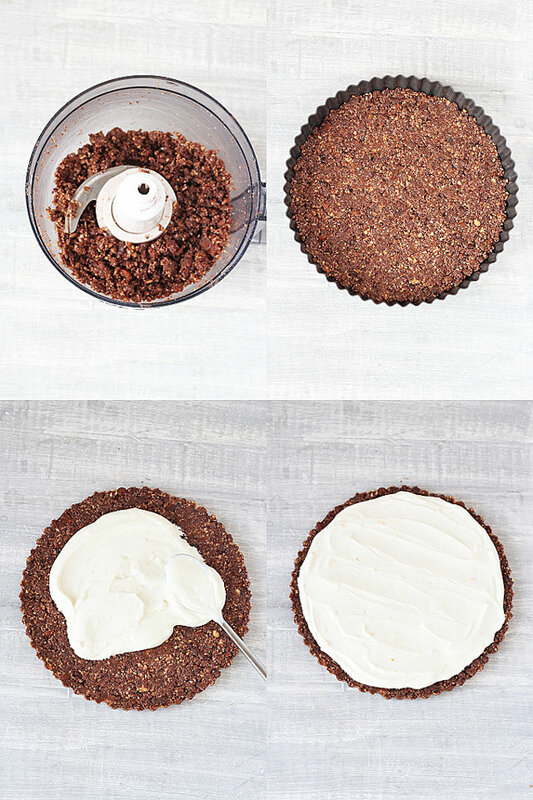 It is simply cream cheese and greek yogurt you mix together and flavour with a little vanilla extract and orange zest. 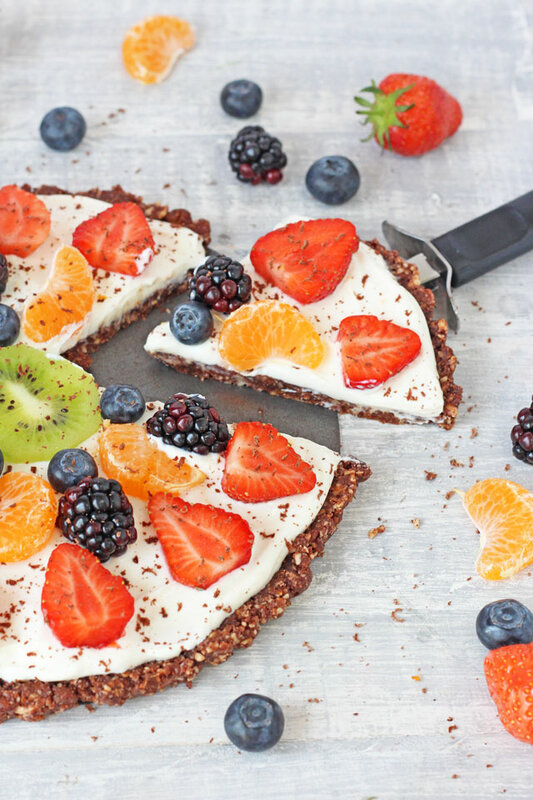 You can then use whatever fruit you like or whatever is in season to top the pizza. For a dairy free version you can use whipped coconut cream in place of the cream cheese and greek yogurt. This is also a great recipe to get the kids involved in making. Letting them choose the fruit and decorate the pizza is a sure way to get them excited about their food. First, make the base by blitzing the almonds in a food processor until they have broken down into a fine consistency, almost like almond flour. Add the dates, melted coconut oil, cocoa powder and vanilla extract and continue to blitz until the dates have been finely chopped and everything is well combined. Looks great! Do you know about how many ounces of dates you used? I buy baking (already pureed) dates at the Mediterranean store & want to substitute them. Thanks for the recipe! Hi, my daughter is allergic to coconut, so unfortunately coconut oil is not an option. What oil would you recommend as a sub? You could use grapeseed oil. We have also started using avocado oil which has a more mild taste. What else could I use in the base that is not nut-based? I’d like to try this for my son’s school, but they have a strict nut-free policy. Looks yummy. About how big is this pizza or how many people does it serve? Thanks! Hi I am making this for my grandkids. My grandson is so very particular and I am afraid if the crust is soft he will not even try it. Have you ever tried baking it to crisp it up a little bit? If so, what temp and how long and did it turn out? Wow this looks great! But it is worth pointing out to readers that dates do contain a lot of sugar as does fruit, so it is not a super healthy pudding…although healthier than a lot! Sugar is still sugar! We feel like sugar from fruit is much healthier than regular refined sugar. The presence of fiber and nutrients allows the sugar to be moderated and released throughout the day, rather than a straight dose of quick sugar. Much healthier when it comes from fruit! I would love to make this! What size pan or tin is recommended? Do you know what size pan this calls for? This recipe looks delicious. I was wondering if the crust be stored in the freezer? I made this for my daughter’s party over the weekend and it was easily the most popular dish. I had so many requests for the recipe that I just shared the link on my FB page. Even the non-health-conscious sugar-adicts loved it.